The second day on my new bike brought me to Than Uyen, it’s a good thing I ended up going back to Hanoi, if I’d continued on from Son La directly to Than Uyen, like I had planed, I would have ended up at a road that stops at a river and no bridge! I might have been able to hire someone with a boat to transport me, but luckily I did not have to deal with that. 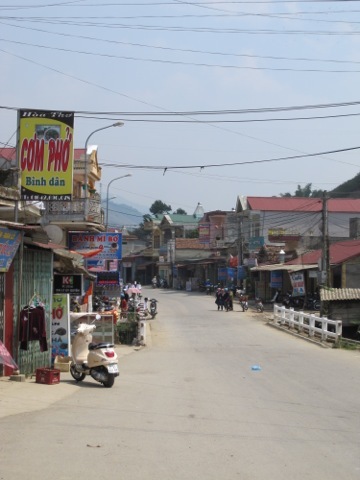 Not much to say about Than Uyen, it’s a town on the way to someplace else. My next stop was Sapa. Holy overtouristed batman! This is the number one tourist destination in the north, I stayed there for a night and got out of there. 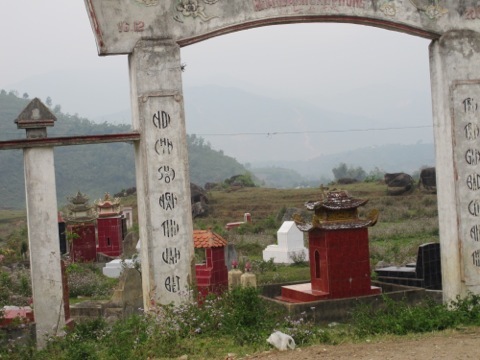 There is an “ethnic” village just outside of town which should be avoided, Sapa should be avoided as well, unless you need a “people speak english” fix. That leads us to a destination I was excited about, Can Cau. 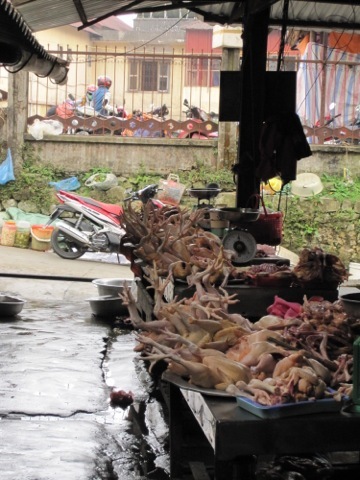 It’s an ethnic village that is hard to get to and has a market on Saturday. The drive from Sapa was not good, the road were soaked and it was trecherous riding. At one point, my rear wheel slid out from under me while going around a corner and the bike and I went down. No injuries to either of us but my ankle was a bit sore. I was delayed by weather and did not get there until 11 am. The place was filled with tourists and mini busses, which is hard to believe considering how bad the road was. It was a let down, but that’s the way of things sometimes. I returned to Bac Hac and got a room for the night. 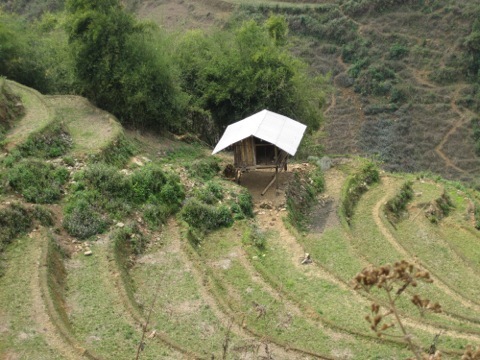 Bac Ha is called “little Sapa” because they are trying to build up their tourist industry there. What I found there were helpful locals, outside of the tourist area, and predatory tourist bilkers in the tourist area. Not my favorite town. 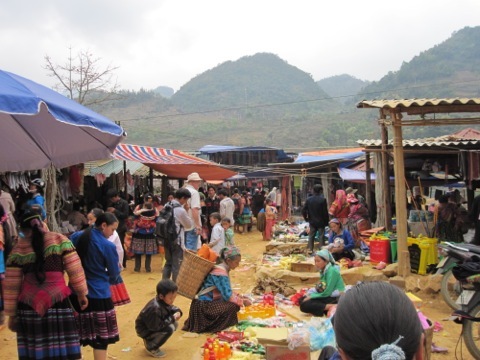 There is a Sunday market in Bac Ha, but it is known to be over toursited, so I just got out of there in the morning. 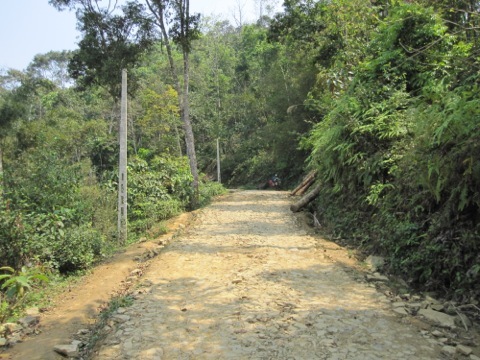 I made a run through the Bac Ha to Xin Man route, a rocky trail through the mountains that saves about 300 kilometers of travel time. I’d heard very bad things about this road, but it wasn’t so bad. Sure there were some intimidating hill climbs and the whole road is “paved” with rocks that stick out of the ground a few inches. I took a wrong turning first thing in the morning and went 20 K on the wrong road. I new I was going the wrong way but it was so beautiful I just kept going. I stopped short of the frontier and turned around, then took a short cut to where I was supposed to be. I spent that night in Xin Man and today I drove to the Pan Hau Ecolodge, a resort that’s very pricy for a budget traveller, but I needed some rest, so I took a splurge day. It’s a very relaxing atmosphere. I arrived too late for lunch so I took a ride a couple of K’s back to find some food, all I could find was ramen, so I brought it back and the cooks prepared it for me and through in some veggies!